Inspired by Isabel Chu who won two events yesterday, Andrew won U1850 and U2000 singles and made the semi-final in U3700 doubles. He was undefeated in singles (13-0) and only lost one doubles match on Saturday! Let's see how much damage he can make on Sunday. Players, be careful. Be very careful. In addition to Isabel and Andrew, not satisfied with winning "only" one event on Friday, Mohit Kumar won his second event on Saturday, too. Local players defended their territory very well. John Hanna from Auburn was the only out of town player who won an event so far. There were also players from San Diego and Sacramento today. There will be more out-of-town players on Sunday. For example, Ben Johnson from England and Thilina Piyadasa from Sri Lanka. Well, I exaggerated a bit. They live in LA metropolitan area now. Lots of action and excitment on Saturday and the highest event was only U2000! Can't wait for Sunday! 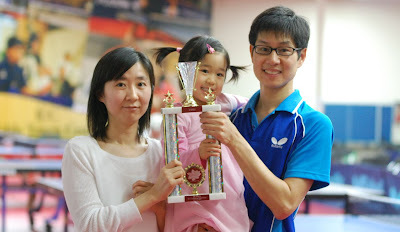 Just for the record, I am also from England but play at the Auburn TTC as well as at Sac TTC and Folsom TCC most weeks. The ICC hosts were incredibly friendly and I look forward to having my photo taken another 58 times on my return to the next ICC event! Remember - Serve legally, or I WILL let you know!